(Macao, Sept. 14, 2016) – Amid fanfare and celebration, The Parisian Macao opened its doors to the public for the first time on Tuesday, Sept. 13 at 8:18 p.m. (CST). The grand opening of the newest integrated resort from Sands China Ltd. (HKEx: 1928) and parent company Las Vegas Sands Corp. (NYSE: LVS) represents the crowning achievement of company Chairman and CEO Mr. Sheldon G. Adelson’s vision for the Cotai Strip. Adelson participated in a Q&A session earlier in the day at a press conference he attended with Las Vegas Sands President and Chief Operating Officer Mr. Robert G. Goldstein and Sands China Ltd. President Dr. Wilfred Wong. The press conference was moderated by Mr. Ron Reese, senior vice president of global communications and corporate affairs for Las Vegas Sands. Tuesday night’s opening celebration included pyrotechnics and a lightshow at The Parisian Macao’s half-scale authentic recreation of the Eiffel Tower, now a prominent feature on the Cotai skyline. The program’s entertainment highlight was a performance by multi-award-winning Belgian singer Lara Fabian, who made her Macao debut. The Cotai Strip was crowded with both locals and tourists, who had gathered outside to enjoy the opening festivities courtesy of live streams broadcast on all of Sands China’s large outdoor screens along the Cotai Strip. Guests of honor at the opening ceremony were Ms. Chan Hoi Fan, acting chief executive of the Macao Special Administrative Region; Mr. Sun Da, deputy director of the Liaison Office of the Central People's Government in the Macao SAR; Mr. Cai Siping, acting commissioner of the Office of the Commissioner of the Ministry of Foreign Affairs of the People's Republic of China in the Macao Special Administrative Region; Mr. Leong Vai Tac, Macao SAR secretary for economy and finance; Dr. Alexis Tam Chon Weng, Macao SAR secretary for social affairs and culture; Mr. Adelson; Dr. Miriam Adelson; Mr. Goldstein; Dr. Wong; Mr. Patrick Dumont, chief financial officer of Las Vegas Sands Corp.; and Mr. Antonio Ferreira, managing director of Venetian Macau Limited. In keeping with tradition, a lion dance was an essential part of the day’s earlier events, and the evening of festivities concluded with a gala dinner featuring a performance by Hong Kong actress and pop star Karen Mok. The opening celebration continues Wednesday with a fashion show at Shoppes at Parisian, and with an additional series of consumer fashion shows and in-store events Sept. 15 and 16. Sands China team members also marked the new resort’s opening Tuesday together with Sands China executives. 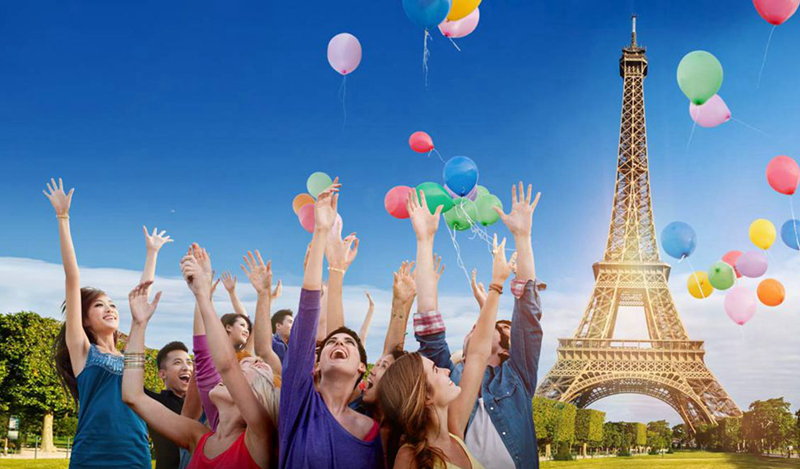 Team member celebrations at the French-themed back-of-house area of The Parisian featured entertainment, games and lucky draws, with prizes including complimentary hotel stays at The Parisian, restaurant vouchers, and tickets to resort attractions like the pool deck and themed water park. Inspired by the magic and wonder of the famed City of Light, The Parisian Macao features a full array of integrated resort facilities that includes 3,000 guestrooms and suites, convention and meeting space, international restaurants, spa, kids’ club, health club, pool deck with themed water park, and 1,200-seat theatre, among other amenities. Its retail mall, Shoppes at Parisian, offers the latest in fashion and couture in a setting reminiscent of the streets of Paris, with an eclectic mix of street artists and entertainers heightening the authentic experience. More information is available at www.parisianmacao.com. Sands China’s property portfolio now offers nearly 13,000 hotel rooms and suites with the addition of The Parisian Macao, which joins sister Cotai resorts The Venetian Macao; The Plaza Macao, featuring the Four Seasons Hotel Macao; and Sands Cotai Central, housing hotels by St. Regis, Conrad, Sheraton Grand, and Holiday Inn; as well as Sands Macao on the Macao peninsula. Together they provide a variety of entertainment options featuring international superstars, duty-free shopping with over 800 retailers offering a broad array of name brands, 1.65 million square feet (150,000 square meters) of meeting and exhibition space for Asia’s leading conferences and exhibitions, transportation offerings, and more than 140 dining options including bars, lounges and Michelin-starred restaurants. Photo caption: Chairman and CEO of Las Vegas Sands Corp. and Sands China Ltd. Mr. Sheldon G. Adelson participates in a Q&A session at a press conference Tuesday in Macao for the grand opening of the company’s newest integrated resort on the Cotai Strip, The Parisian Macao. Photo caption: Las Vegas Sands President and Chief Operating Officer Mr. Robert G. Goldstein and Sands China Ltd. President Dr. Wilfred Wong join Mr. Sheldon G. Adelson at Tuesday’s press conference in Macao for the grand opening of The Parisian Macao. Photo caption: Dr. Miriam Adelson joins Mr. Sheldon G. Adelson on the red carpet Tuesday at the grand opening celebration of The Parisian Macao. Photo caption: Guests of honor, including Las Vegas Sands and Sands China executives, and Macao government officials, officiate the grand opening of The Parisian Macao Tuesday. Photo caption: Multi-award-winning Belgian singer Lara Fabian performs at the grand opening ceremony of The Parisian Macao Tuesday. Photo caption: Pyrotechnics shoot from the authentic half-scale recreation of the Eiffel Tower at the grand opening ceremony of The Parisian Macao, lighting up the Cotai skyline Tuesday night. Photo caption: The Parisian Macao and its red-lit Eiffel Tower illuminate the night sky on Macao’s Cotai Strip Tuesday – the opening day of Sands China’s newest integrated resort. Photo caption: An expansive and elegant rotunda awaits visitors of The Parisian Macao. Las Vegas Sands (NYSE: LVS) is the world's leading developer and operator of Integrated Resorts. Our collection of Integrated Resorts in Asia and the United States feature state-of-the-art convention and exhibition facilities, premium accommodations, world-class gaming and entertainment, destination retail and dining including celebrity chef restaurants and many other amenities. Our properties include The Venetian and The Palazzo resorts and Sands Expo in Las Vegas, Sands Bethlehem in Eastern Pennsylvania, and the iconic Marina Bay Sands in Singapore. Through majority ownership in Sands China Ltd. (HK: 1928), LVS owns a portfolio of properties on the Cotai Strip in Macao, including The Venetian Macao, The Plaza and Four Seasons Hotel Macao, Sands Cotai Central, The Parisian Macao, as well as the Sands Macao on the Macao Peninsula. LVS is dedicated to being a good corporate citizen, anchored by the core tenets of delivering a great working environment for over 50,000 employees worldwide, driving impact through its Sands Cares corporate citizenship program and leading innovation with the company’s award-winning Sands ECO360° global sustainability program. To learn more, please visit www.sands.com, as well as the Sands Confidential blog. For more information, please visit www.sands.com. Sands China Ltd. (HKEx: 1928, Sands China or the Company) is a Cayman Islands registered company and is listed on The Stock Exchange of Hong Kong Limited. Sands China is the largest operator of integrated resorts in Macao. The Company’s Cotai Strip portfolio is comprised of The Venetian® Macao, The Plaza™ Macao, Sands® Cotai Central and The Parisian Macao. The Company also owns and operates Sands® Macao on the Macao peninsula. The Company’s integrated resorts contain a diversified mix of leisure and business attractions and transportation operations, including large meeting and convention facilities; a wide range of restaurants; shopping malls; world-class entertainment at the Cotai Arena, The Venetian Theatre, The Parisian Theatre and the upcoming Sands Cotai Theatre; and a high-speed Cotai Water Jet ferry service between Hong Kong and Macao. The Company’s Cotai Strip portfolio has the goal of contributing to Macao’s transformation into a world centre of tourism and leisure. Sands China is a subsidiary of global resort developer Las Vegas Sands Corp. (NYSE: LVS). Corporate Communications, Las Vegas Sands Corp.